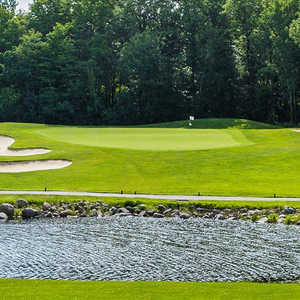 The 18-hole Cattails Golf Club in South Lyon, MI is a public golf course that opened in 1990. Designed by John Williams, Cattails Golf Club measures 6436 yards from the longest tees and has a slope rating of 131 and a 72.1 USGA rating. The course features 3 sets of tees for different skill levels. Moose Ridge Golf Club sprawls across rolling hills blanketed with mature trees and accented with colorful wildflowers. There are more than 90 feet of elevation changes throughout the course, but there are more challenges than the hilly terrain. Well defined bunkers lurk along the greens and acres of wetlands come into play. Opened in 1991, the North and South Courses were Tanglewood's original championship 18-hole course before the West nine was added in 1995. All 27 holes are known as "The Lion." The North/South course has a gently rolling terrain that doesn't offer dramatic elevation changes but it also makes a flat lie hard to find. The 18-hole North/South at Walnut Creek Country Club in South Lyon, MI is a private golf course. North/South at Walnut Creek Country Club measures 6829 yards from the longest tees and has a slope rating of 135 and a 72. The 18-hole River Bank Golf Course in South Lyon, MI is a public golf course that opened in 1978. River Bank Golf Course measures 6038 yards from the longest tees. The course features 3 sets of tees for different skill levels. Tanglewood in South Lyon is home to 27 holes of championship golf that are collectively known as "The Lion." The holes are dived into three nines: the North, South, and West; that are played in three different combinations. The South/West Course is tight, offering little room for error. 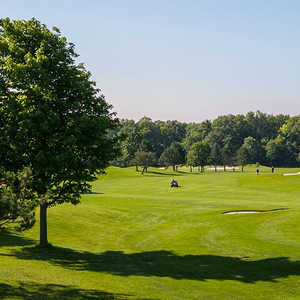 The 18-hole South/West at Walnut Creek Country Club in South Lyon, MI is a private golf course. South/West at Walnut Creek Country Club measures 6790 yards from the longest tees and has a slope rating of 138 and a 72. Tanglewood, also known as "The Lion," boasts 27 holes of championship golf, divided into the North, South, and West nines. The holes are played in three different 18-hole combinations. The North/West Course starts with the gentlest nine before moving on to the newest and arguably the most challenging nine. The 18-hole West/North at Walnut Creek Country Club in South Lyon, MI is a private golf course. West/North at Walnut Creek Country Club measures 6607 yards from the longest tees and has a slope rating of 134 and a 72 USGA rating.